Right at the monochromatic beginning of the film, Bond faces off a corrupt MI6 officer named Dryden. He underestimates him for not being 00: “If the theatrics are supposed to scare me, you got the wrong man”. He knows everyone who gets promoted to that category, and he doesn’t have the two required kills. The dialogue, intercut with a brutal fistfight between Bond and a contact of Dryden, is abruptly stopped by Bond who shoots him, making Dryden the second and “considerably” easier kill. The blood dripping down on the improvised gunbarrel sequence (appearing as Bond shoots down Dryden’s contact as he aims his gun to the secret agent) takes the audience to a lively main title sequence with cards flying around the screen, silhouettes fighting, hearts falling and diamonds cutting through people as Chris Cornell’s “You Know My Name” blasts out. Composer David Arnold specified in interviews that, as the movie dealt with the identity of the James Bond persona, the song title and lyrics should focus on the character’s personality more than in the title itself (“Arm yourself because no-one else here will save you, the odds will betray you and I will replace you […] the coldest blood runs through my veins, you know my name”). Just as in the novel, the Casino Royale is just the gambling battlefield between Bond and Le Chiffre, but the casino itself adds nothing significant to the story. As we move on with the film, Bond will give M a few headaches (storming into an Embassy in Madagascar and killing a refugee bomber) and she will question his promotion: “I knew it was too early to promote you”. Then, he will follow a lead of the bomber to the Bahamas. In both the pre-credit sequence with Dryden and the dressing down moments by M, the script deals with how much of Bond is in this new Bond: Dryden underestimates him for not being a 00 and M wonders if it was too early to promote him – a far cry from the firmly established character we all knew where no matter the actor who played, he was a professional assigned with the 00 code. 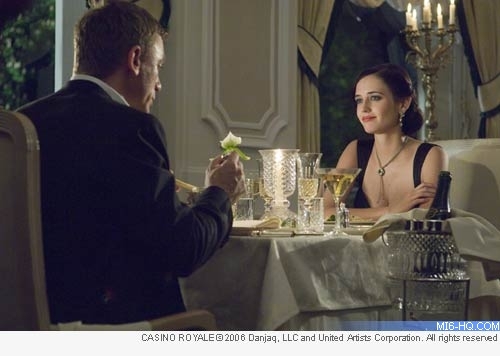 This is exactly one of the many reasons why 'Casino Royale' revolves around the construction of James Bond’s personality and that is shown on the script from the technical and literary aspects. Moments later Bond is finally seated on the casino table facing Le Chiffre, banker of the world's terrorists and final lead of the Madagascar bomber. 007 is wearing a black tuxedo and ordering his trademark Vodka Martini by speaking aloud the recipe. He names it Vesper, after Treasurer who bankrolls him into the game. Vesper questions his methods and his arrogance. During a moment of the film she refuses to re-stake him in order to keep playing to defeat Le Chiffre. 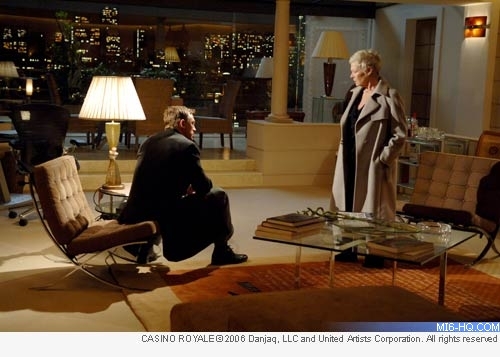 In a missing exchange from the script, Vesper tells him that is an arrogant attitude to think that by beating a man in a poker tournament he’s going to stop terrorism. Yet, he thinks that preventing at least a few terrorist attacks is enough for him and for the world. There is a connection to the beginning of the film, where Bond tells M: “I thought one less bombmaker would be a good thing,” as she is very upset for his cold-blooded murder in Madagascar. 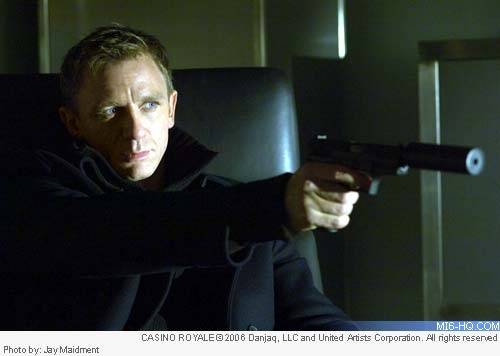 A very interesting aspect of 'Casino Royale' is that James Bond is shown as a gambler in every sense: he disobeys orders as he breaks the unbreakable rule of international relationships (assaulting an embassy) and he ditches the cover identity given in Montenegro in order to send a “warning message” to Le Chiffre – as it happened before in 'Thunderball' (telling Largo he has the “spectre of defeat” in reference to the name of his criminal organization) and 'Tomorrow Never Dies' (Bond asking Carver about his “globally positioned” satellites, one of which mislead a British vessel). As the movie reaches its height, Bond and Vesper will experience atrocious moments like an attack from Le Chiffre’s client Obanno (whom 007 brutally kills) and a painful torture at the hands of Le Chiffre after he loses the game. He’s ultimately rescued when Mr. White terminates Le Chiffre in the name of the organization above him for gambling their client’s funds.